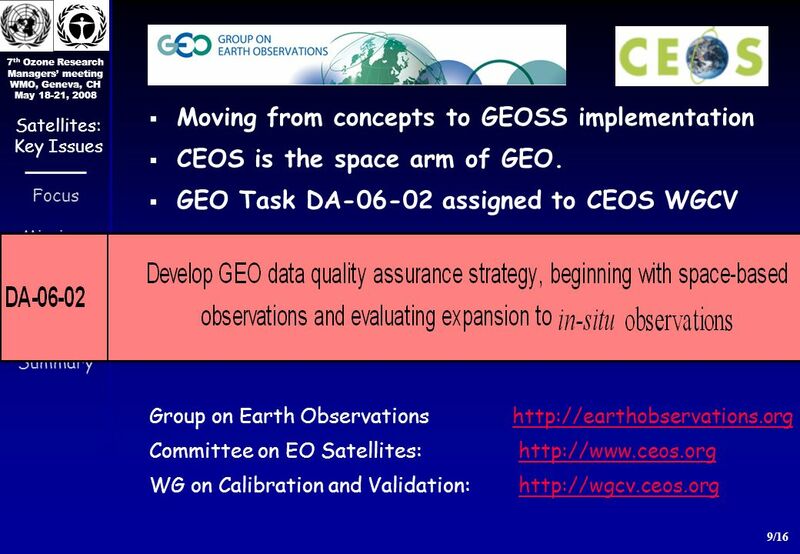 7 th Ozone Research Managers meeting WMO, Geneva, CH May 18-21, 2008 1/16 Focus Missions GEO-CEOS Harmoniz. 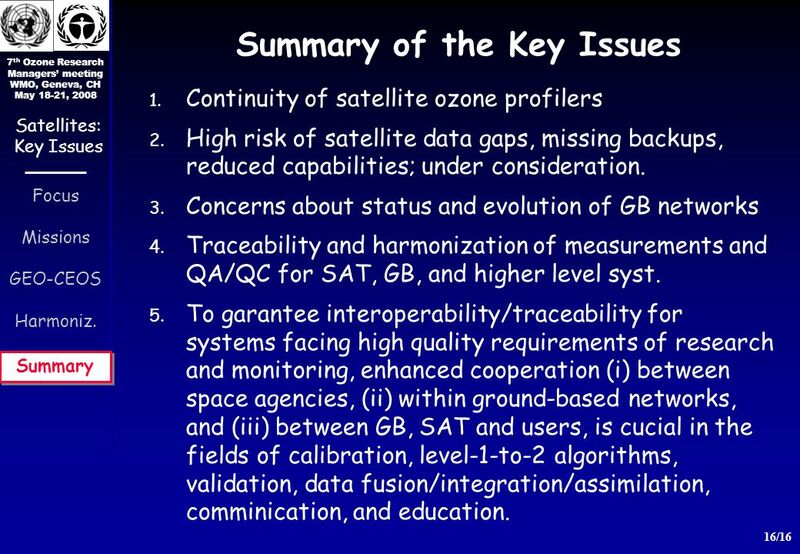 Summary Satellites: Key Issues Satellite Research. 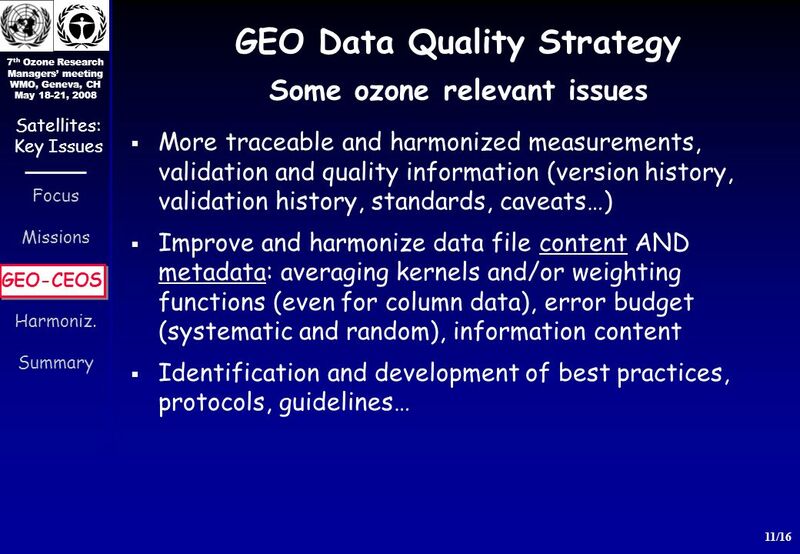 14 7 th Ozone Research Managers meeting WMO, Geneva, CH May 18-21, 2008 14/16 Focus Missions GEO-CEOS Harmoniz. 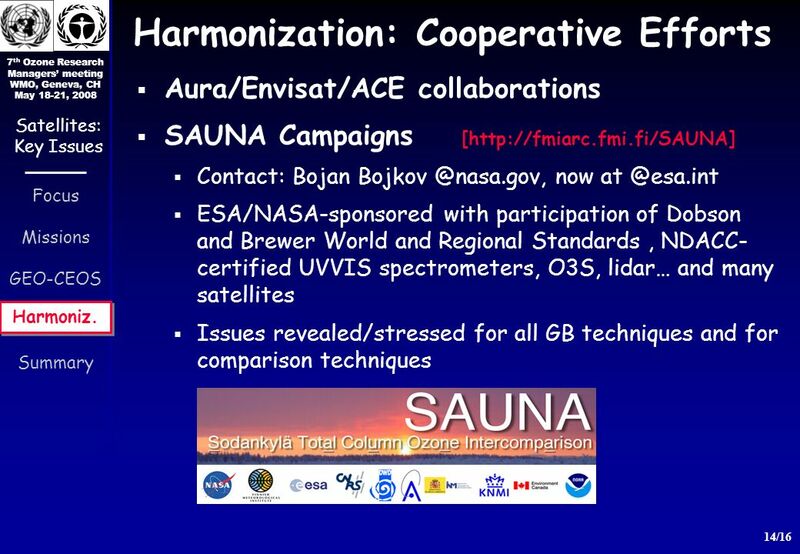 Summary Satellites: Key Issues Aura/Envisat/ACE collaborations SAUNA Campaigns [http://fmiarc.fmi.fi/SAUNA] Contact: Bojan Bojkov @nasa.gov, now at @esa.int ESA/NASA-sponsored with participation of Dobson and Brewer World and Regional Standards, NDACC- certified UVVIS spectrometers, O3S, lidar… and many satellites Issues revealed/stressed for all GB techniques and for comparison techniques Harmonization: Cooperative Efforts Harmoniz. 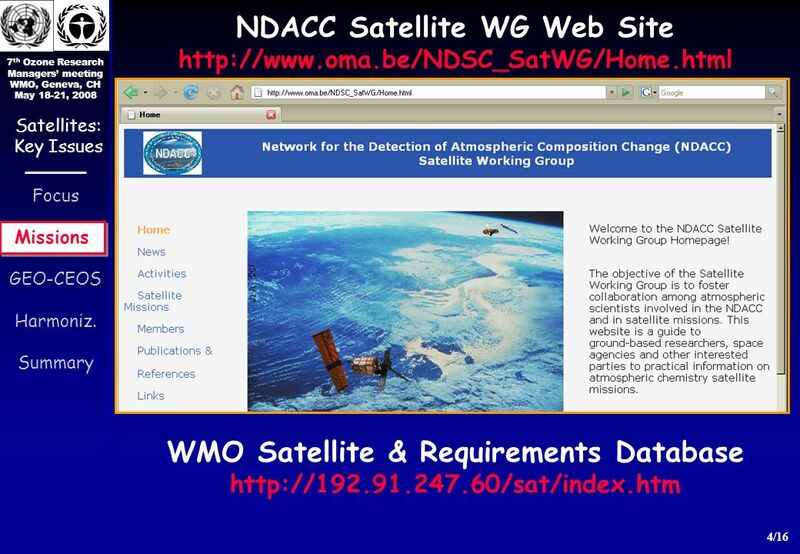 15 7 th Ozone Research Managers meeting WMO, Geneva, CH May 18-21, 2008 15/16 Focus Missions GEO-CEOS Harmoniz. 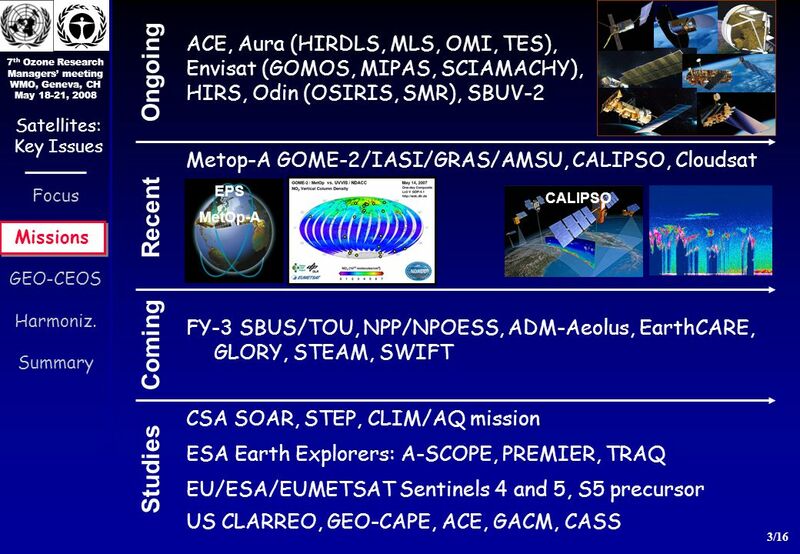 Summary Satellites: Key Issues CEOS-ACSG/NSMC topical meeting and NOAA/NSMC cooperation on FY-3 SBUS/TOU Ozonesonde: JOSIE, BESOS => in progress Water vapour: NASA MOHAVE => CEOS and ISSI endorsed WG and campaigns, COST CEOS-endorsed ESA/NASA/NOAA-funded project: 5-year, calibration of Dobson, participants: Dobson Primary World Standard, Regional Standards, Brewer Regional Standards, NDACC-certified DOAS UV-visible spectrometers Validation Protocols, EU Directive INSPIRE Harmonization: Cooperative Efforts Harmoniz. 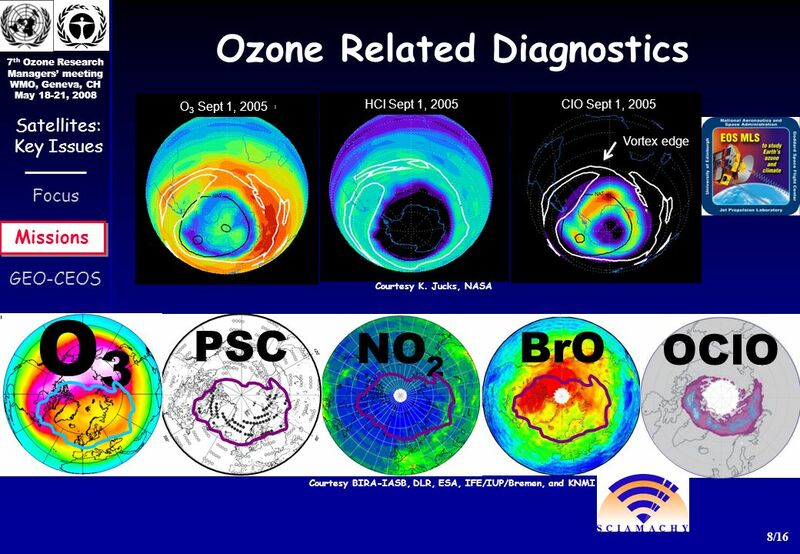 Download ppt "7 th Ozone Research Managers meeting WMO, Geneva, CH May 18-21, 2008 1/16 Focus Missions GEO-CEOS Harmoniz. 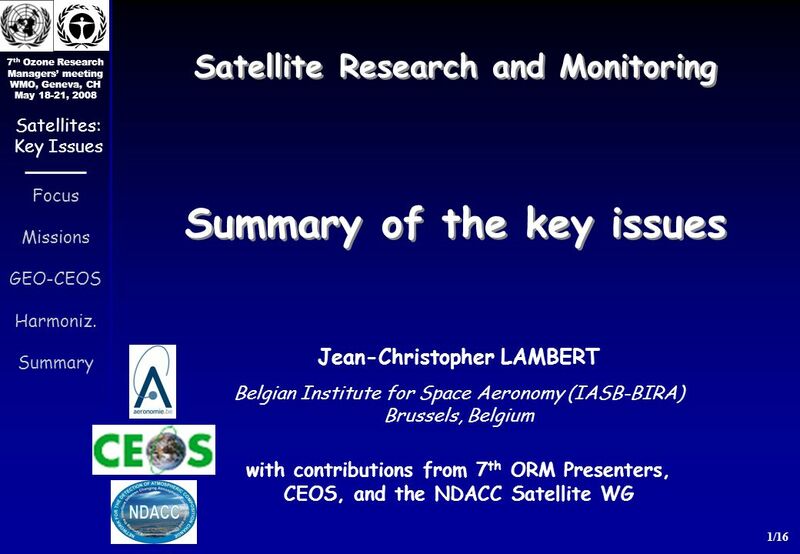 Summary Satellites: Key Issues Satellite Research." GEOSS ADC Architecture Workshop Breakout Session 1b: Inter-calibration Scenario - Stephen Ungar Hosted by the European Commission At the Joint Research. 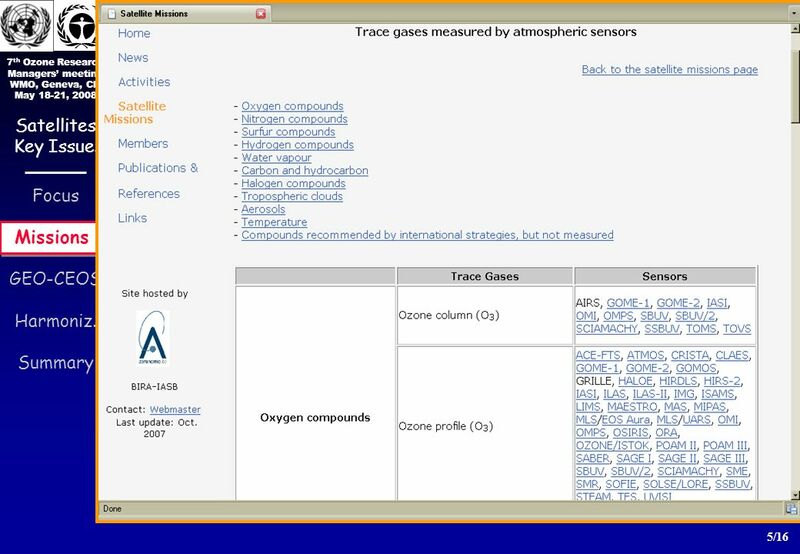 Ozone Research and Monitoring in Canada L.J. 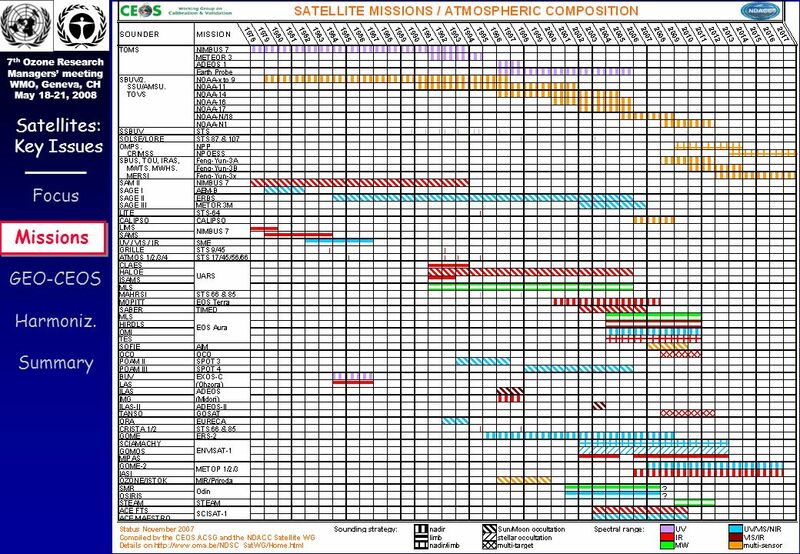 Bruce McArthur Atmospheric Science and Technology Directorate Science and Technology Branch Environment Canada. The 7th Meeting of the Ozone Research Managers, Geneva, Switzerland May, 2008 Satellite Ozone Monitoring and Application Research in China Huang. 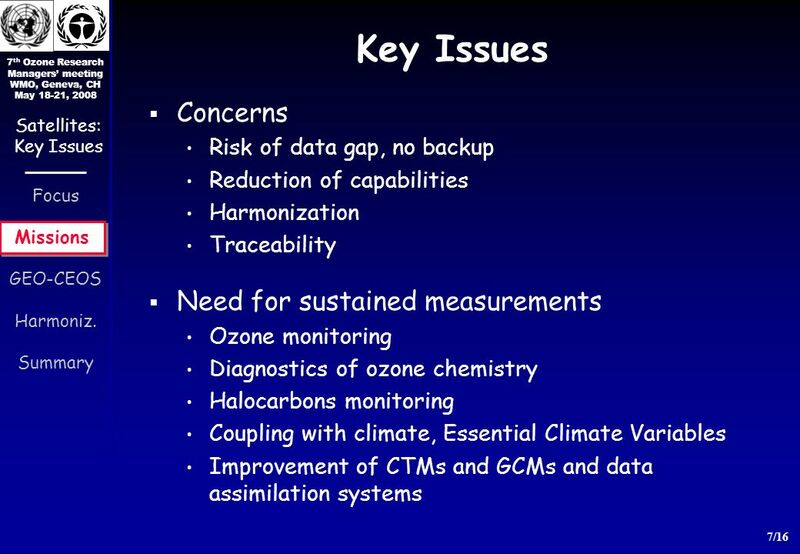 The 7-th Meeting of Ozone Research Managers for the Vienna Convention Systematic Ozone Observations Introduction to the Session 6 No satellite issues as. 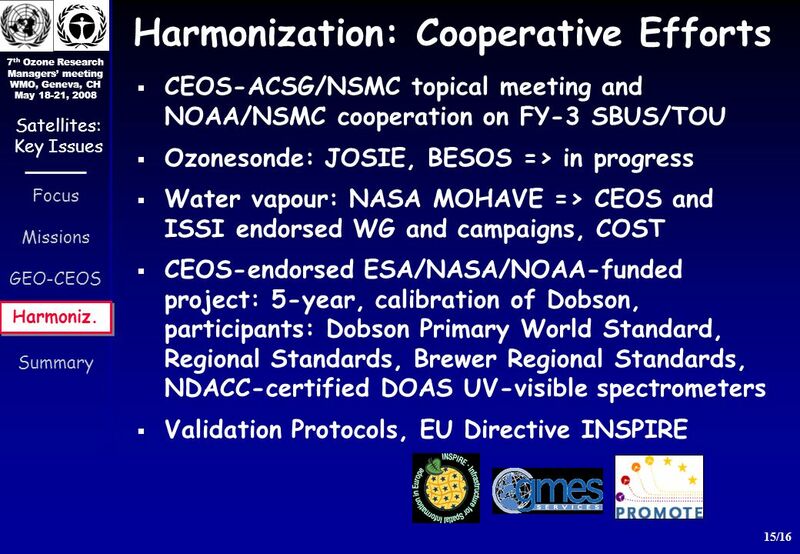 Ozone and UV Research and Monitoring Activities in the Czech Republic International aspects emphasized Karel Vanicek Czech Hydrometeorological Institute. The 7 th Meeting of the Ozone Research Managers, 18–21 May 2008, Geneva 1 Regional Situations with Ozone Monitoring and Research (Region 2: Asia) KOIDE. AVDC page 1 CEOS WGCV-28/WGISS-25 SanYa, China, February 29, Aura Validation Data Center (AVDC) B. R. Bojkov UMBC/GEST, NASA/GSFC. The CEOS Constellations CEOS IP Task Force SIT-18, 21 March 2006. Kathy Fontaine CEOS WGISS 24, DLR Oberpfaffenhofen Munich October NASA Agency Report. Air Quality and Health two recent developments Hennie Kelder KNMI, de Bilt University of Technology, Eindhoven the Netherlands. © GEO Secretariat Work Plan Development Toward Convergence Capacity Building Committee Meeting September 2006 Brussels Imraan Saloojee. 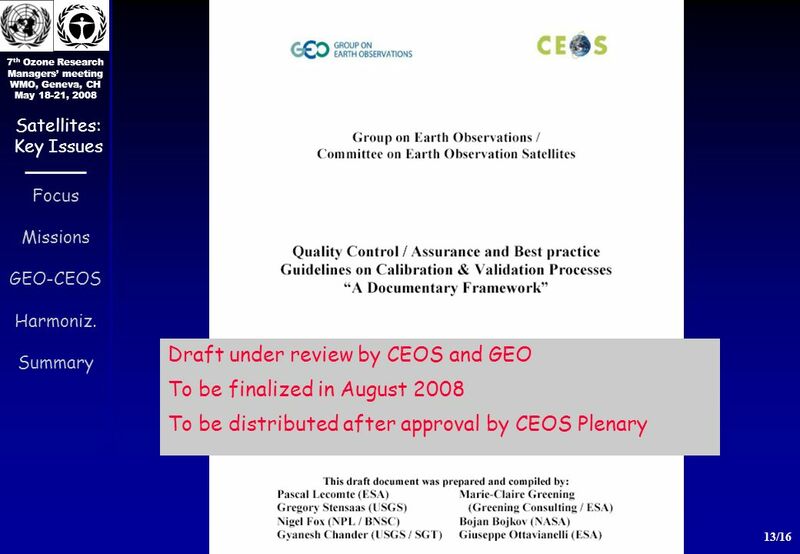 Report from the 7th GEO S&T Committee Meeting Gilles OLLIER – Policy Officer « Earth Observation » EUROPEAN COMMISSION Research Directorate General - Environment. Strategic issues M. Nyenhuis, R. Busskamp, S. Göbel, T. Lüllwitz. 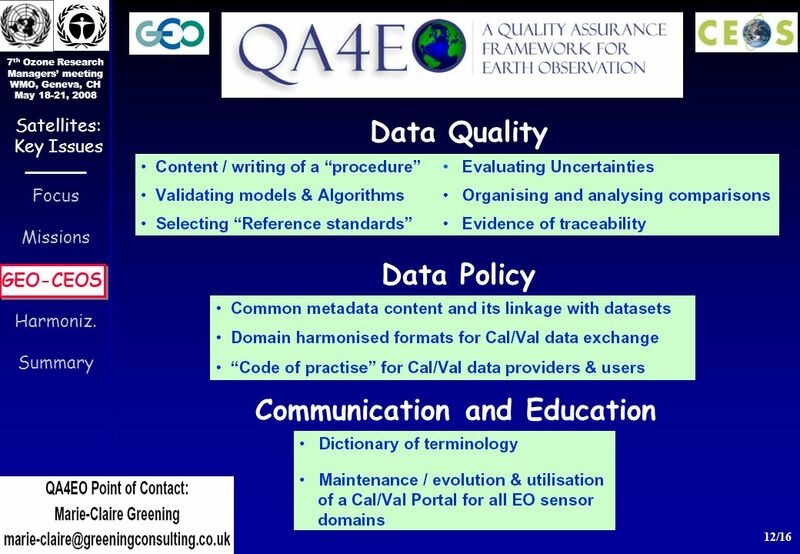 GEONETCast Initiative of GEO presented at the EC GEONETCast workshop 5 March 2006 GEO Secretariat. 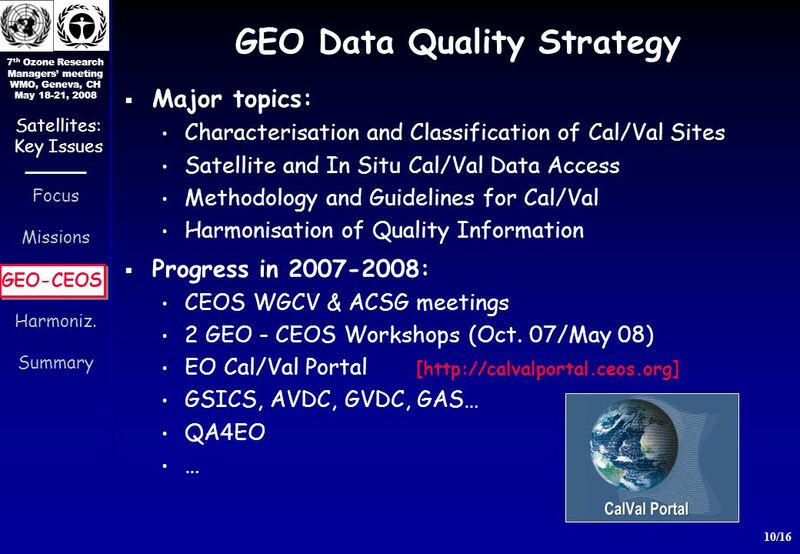 1 GlobModel The GlobModel study, initial findings and objectives of the day Zofia Stott 13 September 2007. 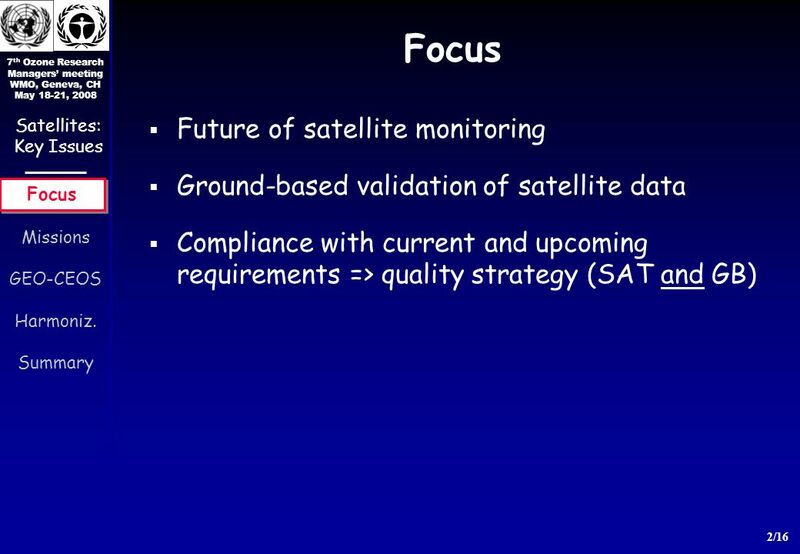 Slide 1 GlobMODEL workshop, ESRIN, Sept 2007 Assimilation of Earth-observation data into Earth-system models Practical considerations in the transition.